While nightmares are no fun for anyone, when they repeatedly affect a child it can be particularly scary. From the still of the night, a child may suddenly start screaming and crying. Initially, it can be difficult to console the child and get them calm enough to go back to sleep. Why do nightmares happen? What does it mean to have a nightmare? Does it suggest something is wrong with a child or that something bad has happened? The symptoms, common causes, and most effective treatments of nightmares are fairly easy to identify. If we as parents can understand the incidence of nightmares in children, including identifying potential causes, we can all sleep a little better. Let's take a look. What Are Nightmares or Bad Dreams? Nightmares are similar to dreams in that they contain vivid imagined activity during sleep, often with an intense emotional experience or memory, but they tend to be distressing when recalled upon awakening. 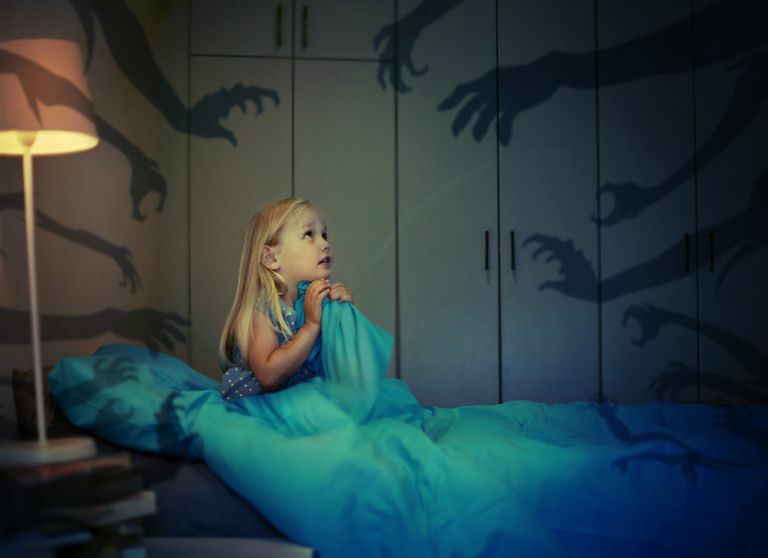 Nightmares begin to occur in childhood and they are thought to be part of our ability to develop appropriate fear responses to real-world threats. Nightmares are usually remembered, at least somewhat, by the person who experiences them. This is true for children as well, who can often describe the fearsome details. If the child remains asleep, not responding to questions appropriately, with little recall of the event the next morning, this instead likely represents a sleep terror. How Common Are Nightmares in Children? Nightmares are quite common among children. Specifically, 24% of 2- to 6-year-olds, 41% of 6- to 10-year-olds, and 22% of adolescents report nightmares. Most nightmares occur in the second half of the night, when there is an increased amount of rapid eye movement (REM) sleep, which is often associated with vivid dream imagery. In contrast, sleep terrors usually occur in the first one-third of the night and arise out of slow-wave sleep. Most adults can recall having at least occasional distressing dreams; it might even seem unusual if an adult never recalled having a nightmare at least at some point in life. Nightmares are produced by the parts of the brain that are responsible for REM sleep. These include areas important in memory and the processing of emotional experiences, key elements to nightmares. The areas that are particularly active during REM sleep include the amygdala, parahippocampal gyrus, and anterior cingulate gyrus. These vivid dreams can seem very real, and this might be why the impacts are especially distressing to children who may not fully understand what they are. Sleep apnea is probably the most important potential cause to identify. Children with sleep apnea often experience snoring, bedwetting, and teeth grinding. They may have restless, sweaty sleep with mouth breathing. During the day, children with sleep apnea may have attention, behavior, and growth problems. Treatments can help to reverse these symptoms, including resolution of nightmares. Ultimately, if you are concerned that your child’s nightmares are disrupting his or her sleep, then you should speak with your pediatrician about the need for possible additional evaluation and treatment. This may be especially important if the nightmares are frequent and begin to lead to anxiety during the daytime, especially fear of going to sleep. In general, treatment of nightmares is not usually necessary. Most will resolve in time without any intervention. If they are particularly upsetting, it can be helpful to use dream rehearsal therapy. Medications like prazosin may rarely be used. If an underlying cause is identified, such as sleep apnea, treatment should be directed at this trigger. Durmer, JS and Chervin, RD. "Pediatric Sleep Medicine." Continuum Neurol 2007;13(3):153-200. Hobson, JA et al. "The Neuropsychology of REM Sleep Dreaming." Neuroreport 1998;9(3):R1-14.